TTS Liftec arranged a SafeRoll presentation day at Hangö Stevedoring in Hanko in cooperation with partners and customers 14.4.2016. 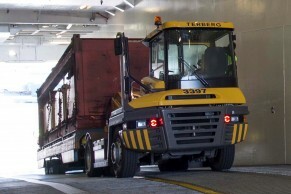 The event was arranged to present the new SafeRoll system – TTS Liftec’s new innovation in RoRo handling. 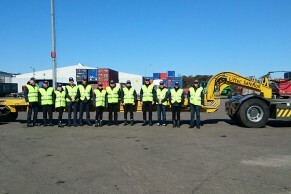 Hangö Stevedoring is one of the companies where TTS Liftec has delivered SafeRoll this year. Rabbe Johansson-Juup, Technical Director introduced Hangö Stevedoring Company and their operations in Port of Hanko. Anders Ahlvik, Managing Director of the Port of Hanko also gave a presentation of recent years and future plans of Port of Hanko. Hanko is one of the most successful ports in Finland and is operated efficiently and securely. In 2015, their overall traffic increased by 11 % compared to the previous year. Olli Mäkinen, General Manager of TTS Liftec, introduced SafeRoll and the latest results it achieved, such as improved safety. He also explained how the system tolerates possible driving errors and offers improved efficiency due to higher payloads and longer lifetime for tractor axles. 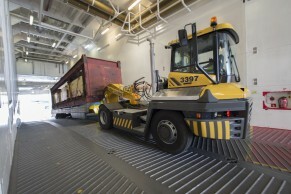 On the Transfennica ship ‘Trica’, a RoRo cargo ship, the SafeRoll system was put into action with a RoRo tractor and cassette trailer driving up an 8 degree ramp, with an 85 tonnes load and then up another 8 degrees ramp to the weather deck. SafeRoll made the drive with normal operation speed both ways going up and back down again by pulling and pushing the cargo cassette. It then drove back up and made a full stop in the middle of the ramp and then accelerated with full speed back-up and then did the same by pushing the cargo cassette down. Every pull/push was made with the same 85 tonnes load using a Terberg RT283 tractor. The tractor driver told World Port Development that “driving is as stable as driving on flat ground. Prior to SafeRoll you could never stop on a ramp, but now with SafeRoll you can stop in case of disturbance and do it securely.” The first development break was 20 years ago when the cassette system was introduced for RoRo handling. SafeRoll is now the next new innovation concluded technical director Rabbe Johansson-Juup.